The purpose of Luxury Vinyl Plank is exactly what it sounds like. It is meant to mimic the look of natural hardwood floors. Just like wood flooring, LVP comes in a variety of widths, and imitates the look and feel of natural wood almost perfectly. All pricing posted is for two pallets or more. For less than two pallets, please contact our sales team. Water Resistant – Most vinyl products are almost waterproof, making it a favorable flooring even for kitchens, bathrooms, and washrooms. It is better at sealing against damage from water more than your other hard-surface flooring products. We bring the flooring store straight to you by providing an online showroom with an almost endless selection of flooring products, and by delivering actual product samples right to your front door. Easy, convenient and always affordable…that’s been our goal, from the very beginning of DaltonCarpet.com. Actual items may vary in color and pattern from eletronic appearance. Also, actual room scene may be not actual pattern shown. Despite every effort to accurately duplicate each product, when scanned to our website color and actual pattern can appear different. For these reasons we highly recommend that you order samples to view in the convenience of your own home and exact lighting. Did you know? With its introduction in October 2006, luxury vinyl flooring reinvented vinyl flooring, and manufacturers quickly began positioning it as a viable flooring material for homeowners who are well-educated about flooring. It is also seen as an initiative to capture the urban market--condominium dwellers who are loath to install solid hardwood due to cost, or who may be prevented from this by HOA covenants. 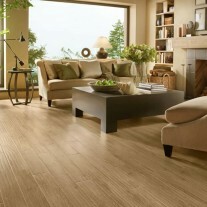 With the luxury vinyl planks you will get the look and feel of a wood floor, without the high maintenance or cost! Many are waterproof, and all are water resistant. Also, vinyl plank flooring installation can be an easier process than most solid wood, or engineered wood flooring. LVP’s have become a win-win for many of our customers. Acclimatization – Before you install your luxury vinyl floor it is important to allow it to acclimatize to your home’s usual temperature for a minimum of 48 hours, as it does expand and contract depending on the temperature and humidity in the air. Protective top layer – luxury vinyl typically comprise four layers, and the top layer is the one that protects the tile from scratches and stain absorption. It is best to opt for tiles that have a urethane or polyurethane top layer and the thicker the better. Measured in mil, products that have top layers under 20 mil are best used in areas of light traffic; the ideal is at least 20 mil – anything higher is going to perform excellently (and generally would be classified for commercial use). Cleaning and Maintenance – of course the main selling point of luxury vinyl tile has got to be its easy maintenance, essentially all you need to do to keep it clean is regularly sweep or vacuum and then damp mop with a neutral or peroxide cleaner from time to time.